When the Pittsburgh Penguins announced on Saturday that backup goaltender Tomas Vokoun would be out indefinitely with a blood clot, it dealt a blow to not only Pittsburgh, but the Wilkes-Barre/Scranton Penguins as well. Zatkoff handled starting duties in his first year in Wilkes-Barre in 2012-13, and he looked poised to take the same role this year. He finished last season with a .920 save percentage and 1.93 GAA to go with a 26-20 record and five shutouts. But right now, he has been deemed Marc-Andre Fleury’s backup until Vokoun returns. Will the Baby Pens be in trouble without Zatkoff, or can they use the veteran netminders on the roster to help keep the team intact to start the season? Here is some more information on the players who will be battling for Zatkoff’s spot as he remains in the NHL. The Penguins signed Mannino to an AHL deal over the summer, and he has been around the league for five seasons. His most notable stint came with the Chicago Wolves from 2009 through 2011, and he racked up 42 wins in 80 games. He spent 2011-12 on four different teams, including AHL clubs St. John’s and Portland. Then, last year, he was a member of the Manchester Monarchs and backed up Martin Jones. In 20 games, Mannino went 10-7 with a .919 save percentage and a 2.47 GAA. He is 29 years old to Zatkoff’s 26 and brings a lot of league experience to the Penguins lineup. In an interview with Penguins radio broadcaster Mike O’Brien, Mannino acknowledged that he could be labeled a journeyman. He said that he comes to Wilkes-Barre knowing that a spot isn’t promised to him and that he is there to push his teammates. “I think the spot itself is going to be a challenge, and just like every year, I want to do whatever I can to be successful.” Mannino said. Mannino’s attitude fits in well with the Penguins’ values, especially as they look to rebound from a loss to the Syracuse Crunch in the Eastern Conference Finals last season. He’s also been around the league and seen Wilkes-Barre play as a member of the opposition, so he should be familiar with its style as he looks to take over as the starting goalie. Although Mannino is currently injured, he’d be the best bet to start the year if he can get healthy in time for the Penguins’ season opener on October 5. Right now, little is known about Hartzell, an undrafted goalie who just finished out his NCAA eligibility at Quinnipac University. While there, he was a finalist for the Hobey Baker Award and was an ACHA First Team All-American. Prior to being sent to Wilkes-Barre, Hartzell saw some playing time in Pittsburgh’s 3-1 preseason victory over the Ottawa Senators. With experienced goaltending already in Northeastern Pennsylvania, Hartzell will most likely start his pro career with the Pens’ ECHL affiliate, the Wheeling Nailers. Chiodo, the one-time playoff cult hero during the Pens’ Calder Cup run in 2004, was invited to training camp after spending several years in Europe, including the last three in Austria. Prior to going overseas, he was a member of WBS from 2003 to 2006 and also saw time with Wheeling. Although Chiodo is a fan favorite, he has traditionally struggled in the regular season and has only posted a winning record once in the AHL. In 2005-06, he looked like he was returning to playoff form when he went 8-4-2 with a .925 save percentage and 2.21 GAA in 14 games. The 30-year-old comes back to Wilkes-Barre with a strong resume from overseas hockey and a stronger sense of experience than he had when he was in his early 20s. Although nostalgia doesn’t win hockey games, Chiodo can get a fresh start in the AHL with the support of the Penguins fanbase. 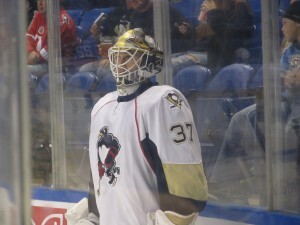 On Monday, the WBS alumni parade rolled back into town when former goalie Jeff Deslauriers was signed to a PTO. Deslauriers was a member of the Penguins in the 2006-07 season when the team had a split affiliation with the Edmonton Oilers. He had a mark of 22-12-3 with a 2.47 GAA and a .909 save percentage. Deslauriers has had stops in the NHL with Edmonton and the Anaheim Ducks, but has largely played in the AHL for the last three seasons. Last year, he was with Fort Wayne of the ECHL for 15 games and played just five AHL contests with the Norfolk Admirals and the Houston Aeros. Although Deslauriers is not a star, he is capable of taking on a starting role and has played over 50 games in the NHL. This is something none of the other potential WBS starters bring to the table, and furthermore, the Edmonton club he played with was on the rise and is just a short time off from being a force to be reckoned with. This is valuable experience he can bring to a Penguins team that is never short on prospects. Mannino is currently day to day with his injury and did not participate in the opening of Pens training camp on Saturday. However, because he has not been ruled out to start the season, he should still be considered the favorite to hold the No. 1 gig until Zatkoff returns. With Hartzell probable to go to the ECHL, Chiodo and Deslauriers will be left to compete for the backup spot. Both players have unique experiences and are familiar with the Penguins’ philosophies, even though the 2013-14 team is different than the one either of them played on. They have also each had their tough spots in the regular season with poor records and injuries. The playing field looks even, but Chiodo has handled a more regular workload than Deslauriers in recent seasons even though it was in Austria. Deslauriers played just 20 overall games in 2011-12 and 18 this past year. Chiodo, meanwhile, has been in at least 20 games in each of the last three years. Final Call: Chiodo will earn the backup spot to Mannino, and Deslauriers will be released from his PTO.